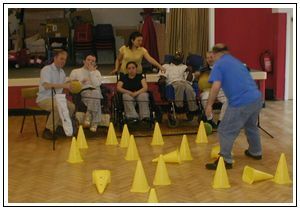 Zodiac Arts is a well-established partner, delivering specialist sports-based training for such organisations as Westminster PCT, Westminster City Council, Scope, MIND and Sure Start, and other local voluntary organisations that provide support to people with learning disabilities and their carers. It has a good reputation of delivering sensitive and appropriate sessions. Therefore Zodiac Arts is ideally placed to act as a change agent in bringing about the changes needed to decrease health inequalities relating to physical exercise for people with learning disabilities. Developing, in partnership with these organisations, smaller projects which are aimed at reducing the barriers to physical activities offers a real chance to include people in mainstream services, to enhance health, improve motor skills and reduce obesity. In so doing, our Project will significantly improve the life chances for this group of people.